Like our movement. Like Save our Education Movement Facebook fanpage here. We declare that education as a constitutionally-guaranteed human right is a just struggle of the Filipino youth and students and of the Filipino people as well. With the understanding of the current education that is colonial, commercialized and fascist, it results in an education system that is irresponsive of the needs of the Filipino people for a genuine national development. Thus, we believe that in order to achieve genuine education reforms, the government must create a pro-people national budget allocation that suffices for the basic social services, including education. 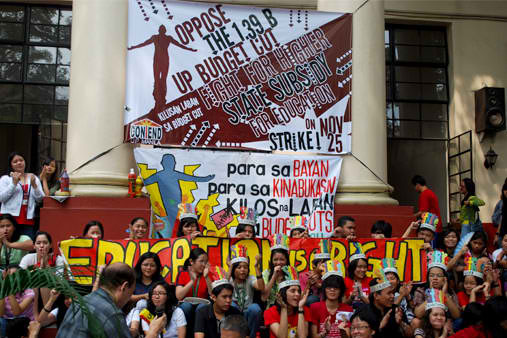 UP Manila students, faculty and school officials staged a strike in December 2010 to oppose budge cuts in state universities and colleges. A signature campaign held during the height of anti-budget cut campaign in UP Los Banos. 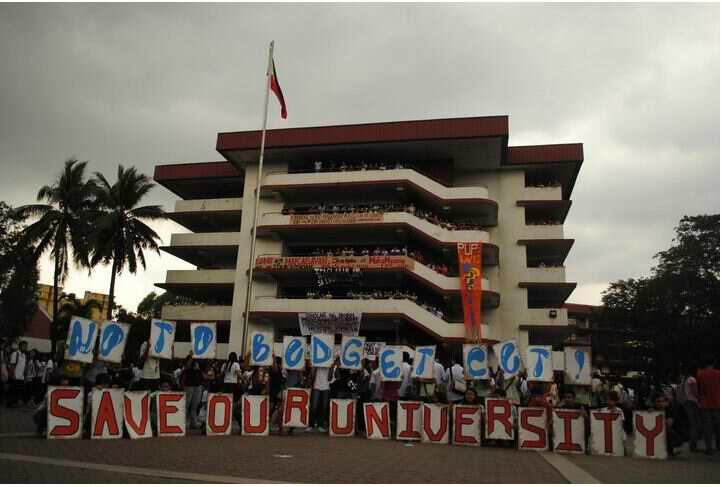 With the government’s mis-prioritization of education and other social services, three of 12 State Universities and Colleges (SUCs) in Southern Tagalog region including University of the Philippines System (P 208M), Batangas State University (P 5.8M) and Cavite State University (P 10.5M) suffered decrease on both maintenance and other operating expenditures and personal services. Further, capital outlay remains to receive nothing leaving us with no infrastructural development and acquisitions for all SUCs. Other social services such as health and housing also share a continuously decreasing budget that result in a dismal state of the Filipino people. Housing services is allotted with only P 5.6B the same as last year to cater not for the hundreds of thousands of families dislocated from their settlements, but for the members of the Armed Forces of the Philippines. Health services increased to P 49.9B from the current P 36B, but remains insufficient to attend the increasing demand for health units and health workers. 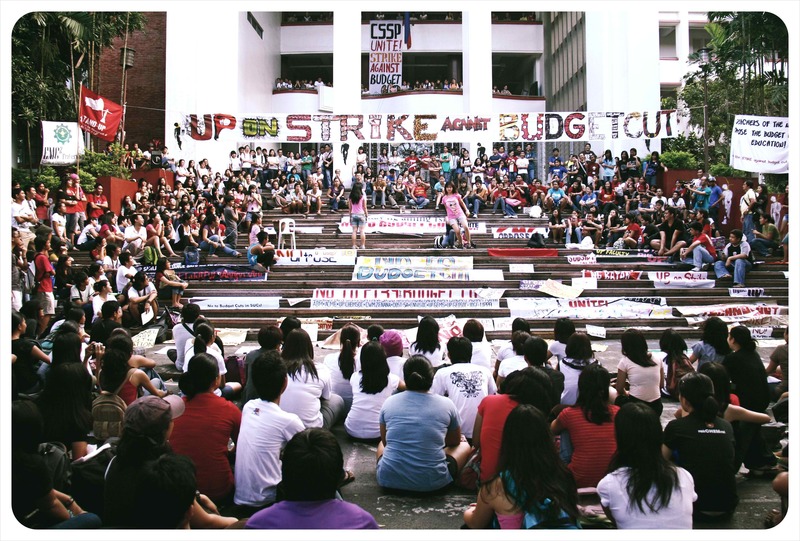 Almost 2,000 students, faculty and school officials walked out in December 2010 to stage a strike against budget cut in UP. Thereby, we call for a pro-people budget allocation on basic social services that will cater to the needs of the Filipino people. We assert that the government must re-channel the biggest share of the general budget to education and other basic social services instead of debt servicing. We detest any schemes and tactics to further increase military spending, pork barrel and other band-aid programs of the government. We remain that through forging unities and solidarities among students, parents, teachers, educators and all other stakeholders through engaging in various forms of activities and generating widest network of people with the same advocacy that the advancement of genuine national development will be realized. Intensify our fight against Aquino administration’s mis-prioritization of education and other basic social services! Fight for a pro-people National Budget allocation! A strike held in Polytechnic University of the Philippines in Sta. Mesa to oppose budget cut in state universities and colleges. 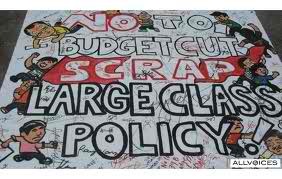 This was signed by 83 concerned individuals during the Convention of SAVE OUR EDUCATION MOVEMENT last August 2, 2011. Anakbayan-Southern Tagalog is the primary convenor of SAVE OUR EDUCATION MOVEMENT.